Christmas ribbon pack to make bows on decorations to hang from a tree. Pack of Ribbons suitable for making bows to attach to your Christmas Decorations so you can hang them easily on your tree. Colours vary per pack. All our Christmas decorations have a loop for putting a ribbon on. Each ribbon pack contains 3 ribbons, each 1 meter in length. Measure 29cm of ribbon and cut ends to a point. 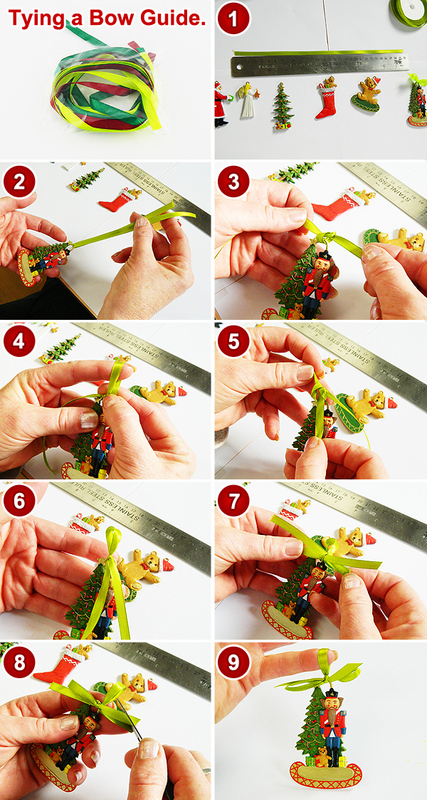 Put the strip of ribbon through the loop in the christmas decoration of your choice. Make sure that one end of the ribbon is 4 cm shorter than the other. Tie a simple knot to hold this in place. To make your first loop you then rap the long end around your finger and then hold the loop and wrap the short end around the neck and pull through the underside to knot it in place. At this stage the ribbons should be approximately the same length so it does not matter which strip you choose for the 2nd loop. Fold approximately 2 and a half cms of one strip in half to form the start of the second loop and then wrap the second strip around it and pull it through the lower section to complete the loop and finish the bow. Once you are satisfied with the bow length trim any excess ribbon strips and remember to keep any trim at an angle to give a clean point to the ribbon ends. Click the button below to add the Colourful ribbons pack for Christmas decorations to your wish list.